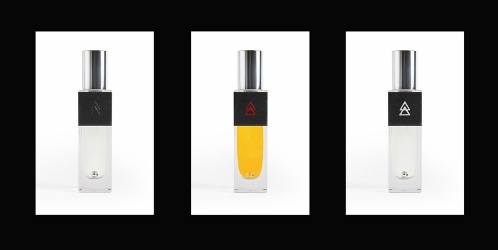 Portland-based body adornment / jewelry brand The Sum has launched three unisex fragrances developed in collaboration with perfumer Josh Meyer: The Black, The Red and The White. The Black ~ "Rich, luxurious, and effortless. The Black is a meditation on the absence of color. Its addictive grace heightens all of our senses with its soothing intensity and depth. It coats our world with a layer of natural beauty that makes everything more pleasurable." With ceremonial oud, black stone and sterling silver (each fragrance contains a sterling silver bead). The Red ~ "Exotic, warm, and enveloping. The Red brings us through a kaleidoscope of far away lands, altered experiences, and endless adventures. Its smooth spicy glow surrounds us with a reassuring confidence to explore the unknown." With fire, saffron, amber and sterling silver. The White ~ "The smell and feeling of clean white smoke. It’s is a bright ethereal presence that purifies through a calming cloud. Fresh yet slightly woody, comforting yet mysterious. It balances new beginnings with the nostalgic feeling of a good memory." With white smoke, iris, wood and sterling silver. The Sum The Black, The Red and The White are $75 each for 30 ml Eau de Parfum. All of these sound rather delicious to me. The White sounds especially appealing to me…unless there is white musk, in which case, not. The White made me prick up my nose as well. Ack, Josh Meyer? Yes, please. Love IA.